Have a look, below, at the destinations we've sampled for you. These are our personal favourite and we virtually recommend each one by experience! Get in touch with one of our consultants today to discuss which destinations would suit you best. This little village is famous for its herd of desert dwelling wild horses, surrounded by mountains and vast landscape. A very special and tranquil place! Damaraland is famous for its desert elephants & black rhino but also for its pertified forests and ancient rock art. This beautiful mountain range provides visitors with stunning desert and rocky scenery. Namibia's prime safari destination! 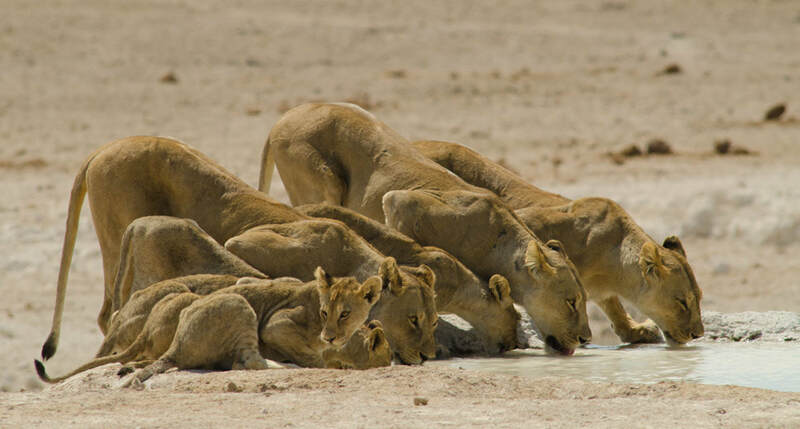 See the Big-5 on guided or self-drive game drives, enjoy the world famous animal viewing waterholes illuminated by night, and be in awe about the amazing scenery! Visit Africa's largest canyon, second in the world to the Grand Canyon in the USA! Hikers can walk up to 5 days through the Canyon and explore the stunning views. Two cities at close distance worth visiting! On the one side is Luderitz, a harbour town famed for delicious seafood dishes and magnificent sightings of flamingos, penguins, seals and whales. On the other lies Kolmanskop, a mining ghost town in the Namib Desert, providing a fascinating insight into historical desert life. A jewel in the desert with great geological history and amazing photographic opportunities! Visit a number of very popular destinations within close distance of each other. World renowned Sossusvlei and Deadvlei are a must see for every visitor to Namibia. The stark sandy Namib desert with its massive sand dunes is a sight never to forget! A spectacular sandstone plateau, grasslands and savannah, and thus a great safari destination. Enjoy guided and self-drive game drives, explore the walking trails or visit the cheetah interaction or OvaHerero Culture Centre. THE capital city and geographic centre of the country. With an international airport, Windhoek is the perfect gateway to all that Namibia has to offer! Stunning accommodation, beautiful diversity of landscapes, and a real sense of wilderness. Explore NamibRand Nature Reserve in style! With lots of water bodies available it is no surprise that this area, home to over 450 animal species, allows for excellent game viewing. The wildlife is protected by several nature reserves and animals travel freely across the unmarked border with Botswana. A biodiversity hotspot this small finger of Namibia is well worth a visit.